Order within 20 hours 59 mins and your order will ship Tomorrow! Obtains mature size faster than most all species. Typically produces less numerous but larger diameter canes. Large foliage and slightly off-set cane sections provide a unique appearance. Phyllostachys Vivax is a very cold hardy giant bamboo similar in appearance to ‘Japanese Timber Bamboo. 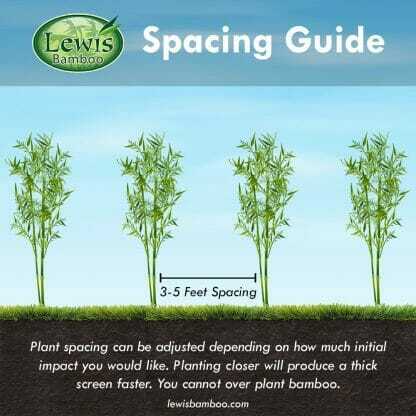 Vivax sizes up the fastest of all large bamboo and is always in high demand. 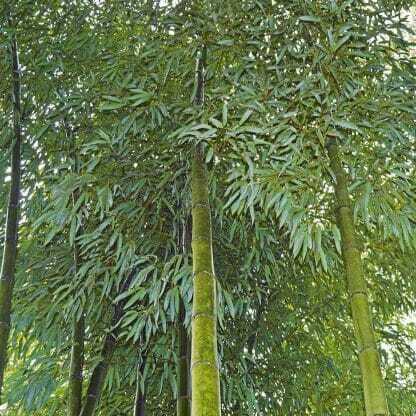 For a Phyllostachys, it has very large leaves with deep green colors. The culm (cane) sheaths are creamy buff color with brown spotting. The oral setae and auricles are absent from the culm sheaths. Small or juvenile plants will not have the same coloring but will have characteristics such as the absence of oral setae or auricles. Shoots of juveniles will be lighter in coloration in most climates. Aggressive in full sun. In USDA Climate Zone 7 expect mature size canes to be over 40 feet in height possibly growing to near 70 feet. In USDA Climate Zone 6 expect mature size canes to be 30 feet in height. In climate zones 7 and warmer, Vivax is an excellent choice. 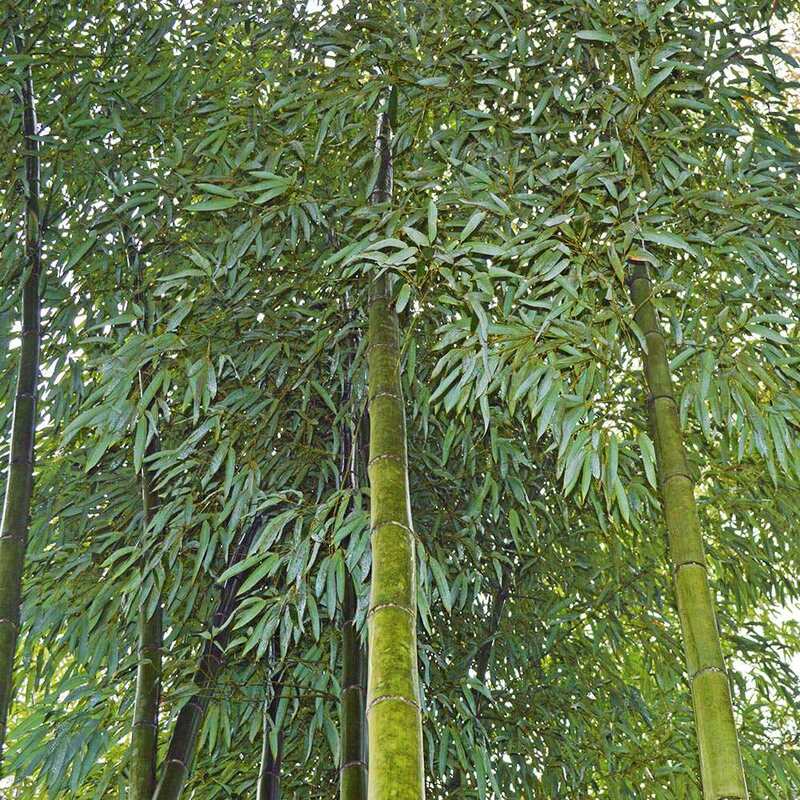 Growing to 40 feet tall on Long Island, N.Y. Vivax has been reported to handle temperatures to -10 F. If you grow this timber bamboo in colder areas such as climate zone 6, expect culm damage from ice and snow damage. The thin-walled culm of this giant snaps with heavy ice and snow loads which is common in zones 6. despite this common occurrence, it still grows to large diameters. New canes will emerge each Spring to replace any damaged ones that might occur during Winter times. It also handles salt spray well and is being grown along coastal areas throughout the U.S.
Vivax has thin walls, which makes it easy to split for working with crafts. It can easily be recognized from a distance by its elegant drooping foliage. Shoots begin to emerge early mid-season and have been found free from any unpleasant taste, even in the uncooked state. 4 years laterWhat a great company. 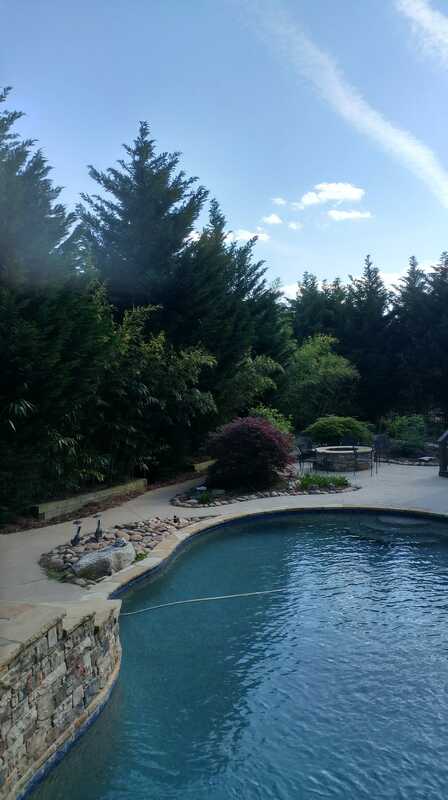 They delivered a few dozen vivax (about 8')to my backyard here in the suburbs of Atlanta, GA and they have grown into a magnificent natural fence (20' and getting higher every year, perhaps 30' for the new shoots this year). No more neighbors, no more barks, and the sound of the rustling leaves is about as tranquil of a sound you could want in your backyard. They grow new shoots every May and if you don't like where it grows, all you have to do is step on it and that's that. Absolutely gorgeous! 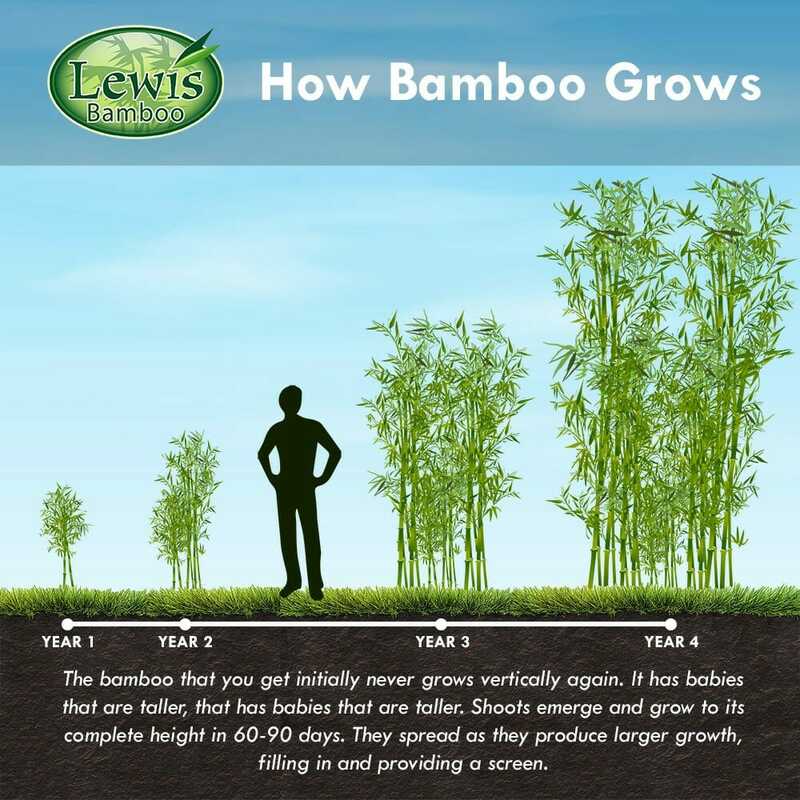 VivaxBeen purchasing all my bamboo plants from Lewis for several years now and have been impressed every time with the quality of the plants . Just bought a Vivax, and as always, it is a first class specimen of the plant. Also prompt shipping, and plant extremely well packed. Excellent plant. Has done well. Looking forward to new growth this spring. Received very healthy plants that have taken to the soil in my area (mid Atlantic) very well. The vivax I purchased from these folks is the fastest growing, and most impressive looking out of 17 species I planted this year. Excellent customer service as well! Thanks Lewis Bamboo! Plants are taking well to the northwest and we can't wait to see them grow next spring! The bamboo arrived in excellent condition. Hi guys, I've got some Lewis bamboo Vivax and Giant Grey Henon, both doing very well in Nashville, TN. The Vivax now has plenty of culms about 4" in diameter and I'd like to try making tea cups. I've read that some bamboo cups have a tendency to split and leak. Do you have any thoughts or advice on the subject? Also, at what age should I harvest bamboo for poles? Thanks in advance. My son and I drove down to your beautiful bamboo plantation several years ago and brought back some potted Vivax in my old Subaru. We planted 6 or 7 Vivax in a long line, spaced 10 - 15 feet apart. Each plant was about 4 feet tall. Then we laid down a soaker hose along the line to promote growth there. New shoots seemed to follow the soaker hose. Those few plants have grown into a dense forest about 100 feet long, 20 feet wide and up to 40 feet tall, making a perfect visual screen as intended. Quite a return on a very small investment. The Vivax is easy to contain - I just mow over the new shoots in spring. Everybody loves walking among the bamboo - it's magical. This winter we got a brutal snow and ice storm and only a few culms broke; made a nice resonant cracking sound. All of the culms were bent all the way to the ground, covered in snow and ice, then bounced right back in the thaw. Beautiful. Of course this spring new culms are busting out all over, as usual. I don't think this Vivax is at maturity yet; still getting bigger year by year.